A short time ago I wrote a blog about how Sexting Could Echo In Your Child’s Future and how we must get real and not pretend it’s a phase or one of those fleeting Social Media crazes. Educating young people to be responsible and know the consequences of their actions, now and in the future. 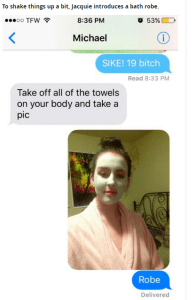 A 16-year old teen (Jacquie) in North Carolina was having a text conversation with a boy (Michael) she knew well and had regular text conversations and random memes with. He was on the Prom committee and they were texting about what she was going to wear to the Prom. 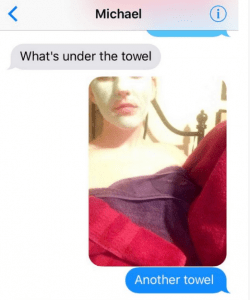 He asked her to show him a picture of what she was wearing at which point she text… “I am not fit for being seen right now believe me” and sent him a photo of her in a towel with a face mask on. As the reported story goes on… Things escalated from that point on. The human psyche no matter what age is wired to want more of what it can’t have. That’s why diets don’t work long term, the brain can’t cope with the restriction on ‘no-go foods’ (cake, sweets, etc) and desires it even more, hence the ‘falling off the diet’ that so often happens. The same is true in this story and whilst Jacquie was thinking she was teaching Michael a lesson (and again context is really important as there may be missing elements from the reported story), his intrigue and desire intensified due to the restriction and curiosity that was building through the text conversation. Intrigue and curiosity are very powerful emotions, that can potentially take over any rational and sensible thinking. The persistence that continued may seem innocent banter between friends, and there’s probably many a thought of ‘good on ya girl’. But, and this is the essential point to share with all young people, a majority of sexting starts with some friendly banter that quickly turns dark as the psychological pressure builds to conform causing irrational decisions and a lasting digital trail.